I was immediately attracted to the summer squash pasta on the cover of the August issue of Food & Wine. Not only did it look delicious, it bore a more than passing resemblance to one of my all time favorite summer pastas. 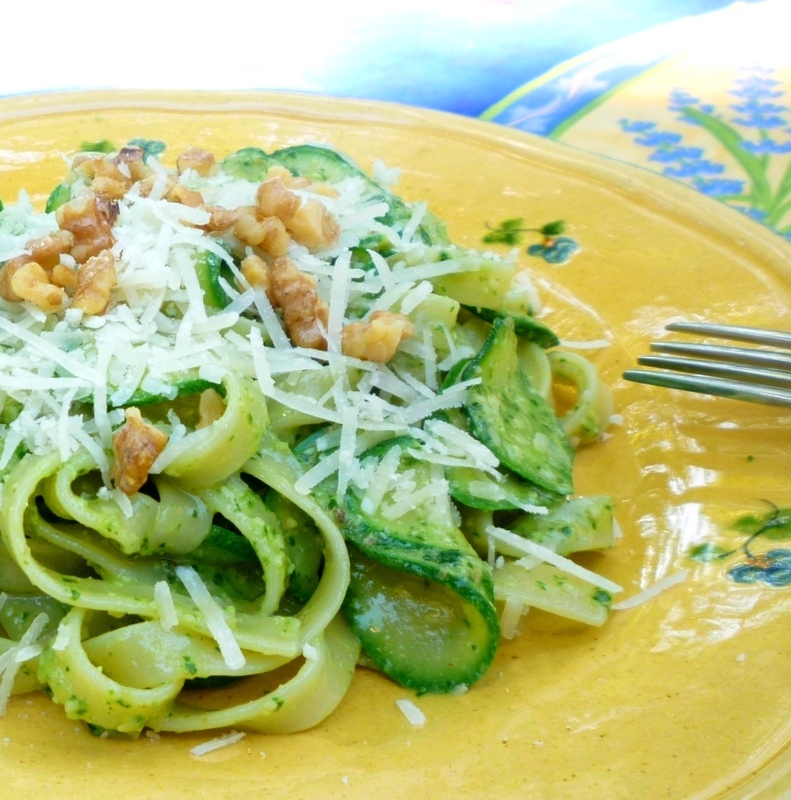 I posted this old favorite—a simple combination of pasta, olive oil, basil chiffonade, toasted pine nuts and thinly sliced zucchini—a few years ago. 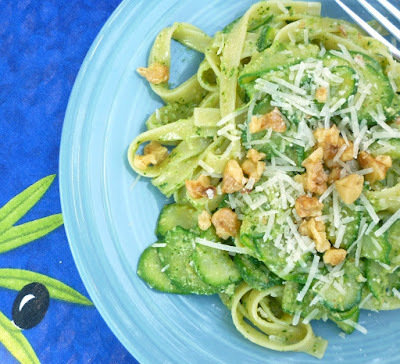 Instead of olive oil, basil and pine nuts, the recipe in this issue of Food & Wine just uses Arugula & Walnut pesto...making it an even easier dish to prepare if you already happen to have some arugula pesto on hand. 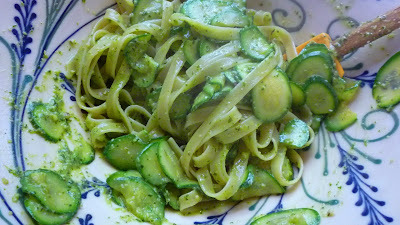 Even though the recipes are similar, the arugula pesto version is so delicious I thought it deserved its own post. As is usually the case, I have made a few changes to the original recipe. For one, I simply use my recipe for arugula pesto. It is not that different from the one in Food & Wine and I happen to like it as is. If you have a favorite version, that's the one you should use. In my recipe, I give a choice of Parmesan or Pecorino...or a combination of the two. If you are making the pesto just for this pasta, I would definitely use at least half—if not all—Pecorino. The salty-tangy quality of this aged sheep's milk cheese is particularly good with summer squash...and walnuts. Another change was my method of incorporating the squash. The Food & Wine recipe tells you to simply add the shaved, raw squash to the bowl of pesto with the hot pasta. The idea is that the squash will cook sufficiently from the heat of the freshly drained pasta. When I tried it this way, the squash had a bit more texture than I would like. I have written my recipe with the same directions as my old favorite, directing you to add the squash to the pot of pasta for the last minute of cooking. This has the added benefit of adding a little bit of the squash flavor to the pasta water (which you will then use to thin the pesto). Finally, the original recipe includes a healthy dose of lemon juice. This is an excellent idea since arugula, walnuts and zucchini are all enhanced by the presence of lemon. But I suggest tasting the finished pasta before adding the lemon juice. 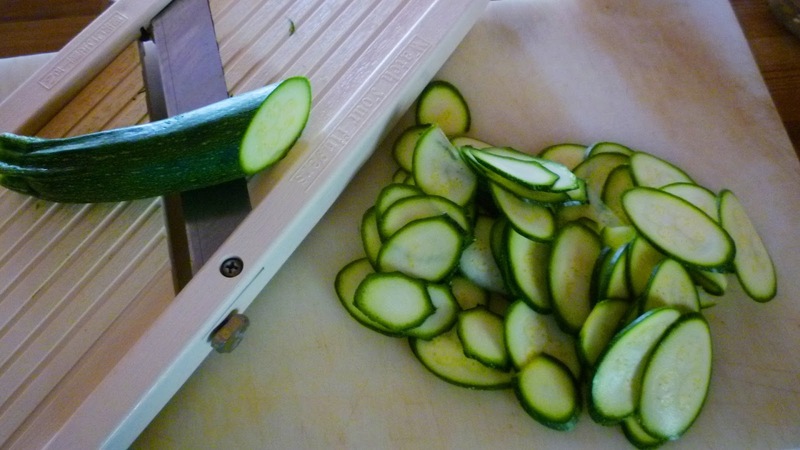 You may find (as I did) that farm/market fresh squash doesn't really need it. If however when you taste the finished pasta, it seems flat...or one dimensional...go ahead and add some lemon. It will give the dish just the right flavor boost. I should mention that this dish is admittedly pretty light. For many it is probably most appropriate for a first course...or a small pasta course. But, if you—like me—would like to serve it as an entrée, simply serve large portions...or maybe top it off with a grilled chicken breast or a salmon filet (pan-seared...baked...or slow roasted). No matter how...or when...you decide to serve this simple pasta...I'm pretty sure you'll love it. 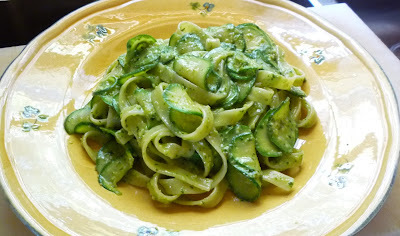 Certainly it has found its place on my rather long list of favorite summer pastas. 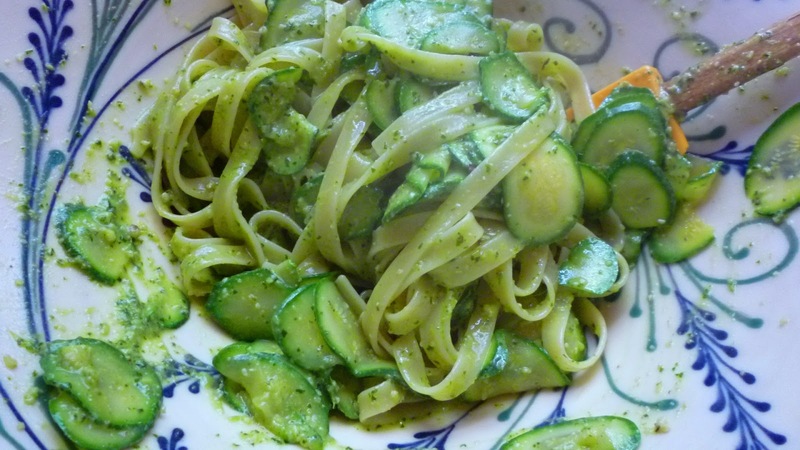 Place the pesto in a large bowl. Set aside. Bring 6 quarts of water to the boil in a large stock/pasta pot. Add 2 to 3 Tablespoons of salt. Add the pasta and cook until almost al dente—it should still be quite firm in the center. Add the squash and stir. Continue to cook until the pasta is al dente—about a minute more. Drain, reserving some of the pasta water. and top with walnuts and freshly grated Parmesan. Serve immediately.